HONG KONG, Nov. 19, 2018 /PRNewswire/ — Honor, a leading smartphone e-brand today announced the exhibition Artology: Explore Art & Technology with You(th) and a collaboration with Hong Yi “Red”, a leading figure in Asia’s art world. Red, renowned for creating art using unconventional materials, will create an exclusive artwork made from approximately 2000 pieces of recycled glass backs from Honor’s flagship collection. The exhibition and installation will debut in H Queen’s, a prestigious architectural icon and art space in the business and retail district of Hong Kong Central on 10 December 2018. The artwork, titled Aurora, embodies the avant-garde collaboration between Honor and Red as they define new ways to create imaginative and contemporary art forms. The installation is ever-changing in color and exudes an aurora hue, made possible because of the layers of nano-scale membranes found within each piece of Honor glass back that reflects and refracts light. “Both Honor and Red dream differently to create momentous works of art. Red is an award-winning artist who “paints without a paintbrush” and is one of the world’s top art entrepreneurs. She uses her imagination and her unexpected approach to turn everyday materials into masterpieces; while Honor encourages youth to break social norms and carve their own path to success. Therefore, to co-create this installation with Red is another demonstration of Honor’s commitment to empower millennials like her,” said George Zhao, President of Honor. “I am very honored to be entrusted with a project of this scale. When I first saw the smartphone glass back, I was captivated by the array of hues that bounced off the surface. It reminds me of the aurora borealis phenomenon. Honor has invested heavily into its design and it is the unique quality of this material that allowed us to create this giant chandelier, inspired by the aurora. 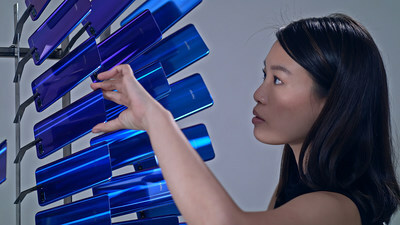 I’m thrilled to have this opportunity to create modern art that uses cutting edge technology,” said Red Hong Yi. The exhibition is part of Honor’s latest brand campaign for digital-natives around the world, and it follows a successful global campaign that featured Clara Bacou, a UK-based digital artist, earlier this year. It is open to the public from 11 December to 23 December 2018 and admission is free. Over the past four years, Honor has expanded its global footprint and its growth momentum has been felt across the world. As of August 2018, Honor had achieved 150 per cent growth in its overseas market, launching in countries including Myanmar, Vietnam, Indonesia, Turkey and Egypt. Honor is a leading smartphone e-brand. In line with its slogan, “For the Brave”, the brand was created to meet the needs of digital natives through internet-optimized products that offer superior user experiences, inspire action, foster creativity and empower the young to achieve their dreams. In doing this, Honor has set itself apart by showcasing its own bravery to do things differently and to take the steps needed to usher in the latest technologies and innovations for its customers. Hong Yi, also known as, ‘Red’, is an artist who focuses on the reinterpretation of everyday materials for her work through the accumulation of objects. Red studied at the University of Melbourne and TUDelft and holds a Master of Architecture. While working in Shanghai for Australian architecture firm HASSELL, Red built installations during weekends from the range of affordable materials available at local wholesale markets. Her artworks featuring portraits of renowned Chinese personalities were circulated widely on social media and media publications, including Wall Street Journal, TIME, New York Times, CNBC and Fast Company. Red has been commissioned by clients such as Facebook, Google, Gucci, Chase JP Morgan and the Mandarin Oriental, and exhibited pieces at the World Economic Forum (Davos), Anchorage Museum (Alaska), Design Miami (Miami) and the Asian Art Museum (San Francisco). Sotheby’s Institute has named her one of the “11 art world entrepreneurs you should know” in 2018. H Queen’s is an award-winning 24-storey development on 80 Queen’s Road Central, a truly prestigious position that will transform the cultural dynamic right in the heart of Central. The development houses spaces for exhibitions with the interest of promoting the arts as well as expanding the audience for art. Designed by renowned architect and artist William Lim, Founder and Managing Director of CL3, one of Asia’s leading architecture and design firms, the building’s unique architecture provides maximum flexibility and eco-friendly features. Design of H Queen’s boasts multifunctional layouts, optimum floor-to-ceiling heights and expansive balconies to accommodate a wide range of exhibition and entertainment needs. H Queen’s also features an integrated building maintenance unit, including a gondola system to facilitate the delivery of artwork through an operable curtain wall façade on each gallery floor. With a design that maximises Central’s urban backdrop, unparalleled flexibility and energy efficiency, H Queen’s is destined to become an architectural icon and a lifestyle destination. Henderson Leasing Agency Company Ltd., as a wholly owned subsidiary of Henderson Land Development Company Ltd., is the leasing and marketing agent of the development of H Queen’s.